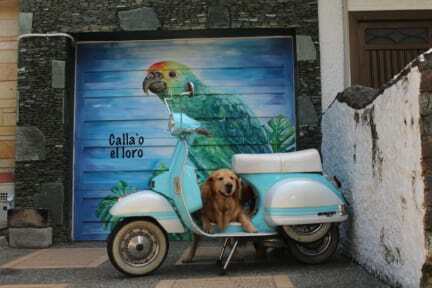 Welcome to callao loro guest house! My name is Dante, your host, im a Golden retirever dog that will make you have a great experience in my home located in the city of medellin where spring is eternal. To my guests i provide colombian coffee and tea free of charge. You will also find plenty of cozy places to chill and have friendly conversations with my guests, my kitchen is open 24 hours. I have 5 rooms with clean cosy beds, 1 room with 8 beds 2 rooms with 4 beds, 2 private rooms with closes 1 of which has a televisión. There are two large living rooms with Netflix, A comfortable patio and a garage for any one arriving by motorcycle. 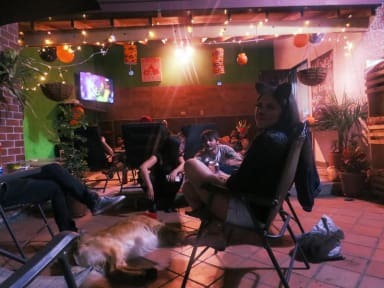 My house is located on La avenida 80 behind the supermarket in laureles (éxito), in this área there is a large variety of restaurantes, cafes and bars for you to have a great experience. Public transport, you can take a bus to floresta the closest train station or take a 15 min walk. The buses and trains are regular as well as the taxis passing by. The location, in the Laureles area, is excellent. It's not all crazy like downtown or Poblado, but there are plenty of good restaurants and cafes like right around the corner. Buses also. So you can visit the crazy parts of town, and then come back and get a peaceful night's sleep. The staff are great. They keep it very clean. Nice pool. People have little pool parties sometimes. Convenience stores are 1 block away. They also keep the coffee pot full of that great Columbian coffee. Great hostel. super chill Guesthouse !! I love there and I am still staying there. Good atmosphere and great staff! It's abit old and would benefit from a revamp but everything works and the beds are comfy! Just alright, not overly clean, some cool and very helpful staff and it's in a good area..
Cleanliness was the main deterrent here. The upstairs and the bathrooms were both trashed when we arrived and our private room was not prepared even through we were a bit later than expected. We also had no key from the outside, so we could not easily lock our room to keep our stuff safe. The atmosphere was not for us, but that’s not to say it’s not for everyone, so my review is neutral. The staff was helpful and understanding in cancelling our second night, however. This place is pretty much a share house not a hostel, with a super weird and uncomfortable vibe. It's not somewhere that I felt safe and relaxed. It was never really clear to me who worked there and who didn't. Very unorganized. Felt more like a crash pad than a hostel.